411 Entertainment has secured a joint deal for Yung6ix with Storm Records. Yung6ix is famous for songs like Oleku Warri Remix and Plenty Money. Storm 360 is proud to announce a multi-level Partnership with 411 Entertainment in respect of their premium Artiste Yung6ix. The kid from Warri has been generating a lot of buzz with his “Oleku Warri Remix” and “Plenty Money” songs amongst teenagers and youths across Nigeria and the Diaspora after being introduced into the industry by 411 Entertainment few months ago. The Outfits have come together to sign a joint venture management agreement deal to position his music career to the zenith. 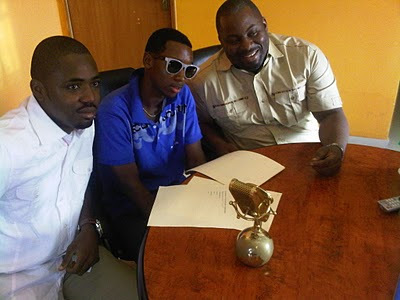 The deal which was officially signed at Storm records office in Lekki, Lagos Nigeria Monday 28th March 2011 had in attendance executives from both Storm and 411 Entertainment. The JVA (joint venture agreement) aims at positioning the brand of the artiste to the next level enabling it to compete with global brands while it dominates locally. Yung6ix a.k.a Sixty, was born Onome Onokokwomo JULY 8TH 1989 in the heartland of Southern Nigeria. Though born to the upper echelons of society, he embraced the streets of Warri, Delta State, and was raised by music. Always a musically gifted mind, Yung6ix picked up the mic at a very young age. Studying the rap skills of the greatest mc's, he created a pattern of flows so uniquely distinct that they can never be replicated. He draws his inspiration from his surrounding, and also from diverse collection of genres. While in high school, and after a series of successful rap battles, Yung6ix hooked up with a duo of like minded artists, and G-squad was formed. The group went on to win a plethora of talent shows in and around southern Nigeria, garnering an ever increasing fan base. After high school he directed his talents into pursuing a solo career and has recorded over 30 SONGS, not including numerous features, that got him Recognition and the acronym "King of the South". The future knows no bounds for this Nigerian enigma. Already a role model to the next generation, yung6ix plans to reach beyond the shores of Nigeria, and lead a worldwide revolution in music. He has been described as the next best thing in Nigerian Hip-hop by Industry pundits.